This is a good time for discovering new and possibly improved ways of relating, nurturing, and healing, once past morning misunderstandings (and possibly hurt feelings). We may be feeling freer and are more encouraging of others’ independence. Taking action on matters of health and wellness can be beneficial now. Physical healing can help inner healing, and vice versa. The Moon is in Leo until 9:07 PM. The Moon is void from 10:12 AM to 9:07 PM. The Moon is in Virgo from 9:07 PM forward (until Thursday, April 30th, at 10:03 AM). 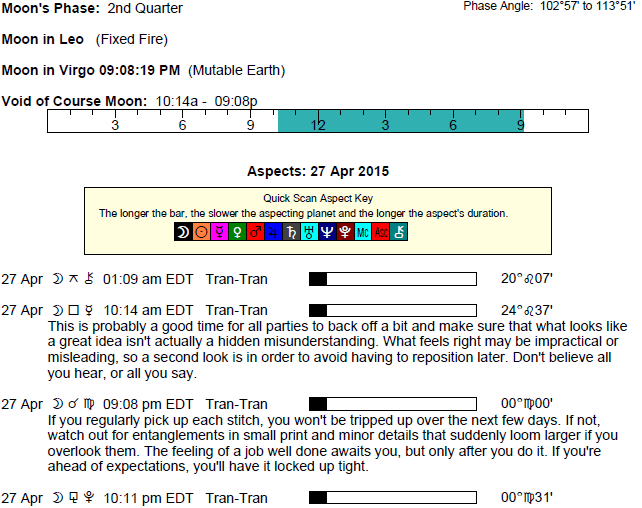 The Moon is waxing, and is in its First Quarter phase. There can be some tension this morning surrounding money or business matters, Aries. Consider that you may be ruled more by emotions than logic on this, and that if there is cause for concern, you’re better off approaching things from a relative state of calm. Later today is strong for expressing yourself naturally and for gaining trust and support from others. Your special and unique qualities are more noticeable, particularly on a professional level, but personally as well. Family may be more inclined to support and help you today. You can make excellent progress on a career or money-making idea now. If something’s bothering you mentally, consider some form of physical activity to deal with stress. 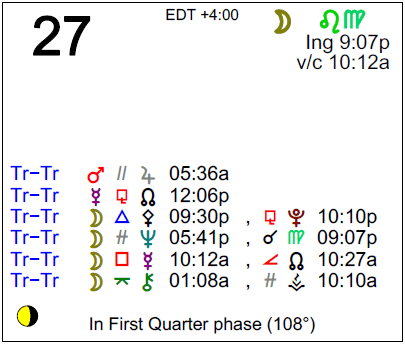 This morning, Mercury in your sign clashes with the Moon in your home and family sector, Taurus. Watch what you say now, as you can unwittingly misrepresent yourself or say something that others take too personally. People in your life may seem very touchy or emotional now. As the day advances, indecision and overthinking fade out and the desire to take action to improve your life or simply to enjoy the moment takes hold. You can end the day in much happier spirits and with a more empowered feeling. Your imagination may be working overtime this morning, dear Gemini. You could become very worked up about a problem, likely regarding a secret or private matter, but don’t make rash decisions based on the emotions of the moment. Our perceptions can be quite askew with the morning’s Moon-Mercury challenge. As the day advances, you are more likely to let go of overthinking and replace it with activity. Taking action on a problem can be very healing now. You might see the connection between physical healing and inner, emotional healing. Even physical activities or exercise can help you to reduce stress now. This morning, there could be a clash of core values or sensitivity with what a friend says, Cancer. You may be getting all twisted up about something that is likely to be blown out of proportion. If balance of power or of give-and-take has been off in a relationship, you could feel this imbalance with intensity. However, as the day advances, you’re less likely to overthink and more likely to take positive action. Troubled relationships can benefit the most now. Do something about a problem, rather than simply think or talk about it. The first half of the day can bring worries or criticism surrounding your professional life or performance, Leo. There can be ups and downs, but try not to get carried away, as there can be much ado about nothing right now. As the day advances, your conviction strengthens. You’re courageous about facing any problems you face, and you easily gain the support of others. The Moon leaves your sign tonight, ending its monthly two-day visit, and emotions tend to steady enough that you can more effectively focus on your practical affairs. What’s discussed this morning could awaken some insecurities, Virgo, and in the first half of the day, you may not be able to get much done due to indecision, worry, or emotion. As the day advances, however, you come into your own, finding ways to take action without overthinking things. A significant other may very well be integral to getting you out of a funk, or you could enjoy a mini adventure with someone special. The Moon leaves your privacy sector tonight, when it enters your own sign. This also serves to build your courage, conviction, and decisiveness. Before midday, there can be some skewed perceptions, Libra. You might easily become worked up over a relationship matter, but emotions and fears can overrule logic and reality now, so take a step back before making big decisions. Nothing much is likely to come of the matter! As the day advances, very good, healing energy is with you, particularly for private, personal matters, but these can also positively affect your health. The Moon also slips into your privacy or mental wellness sector tonight, pointing you in the direction of processing, disengaging, and relaxing. You can feel very much in your element today, Scorpio, even though the day could get off to a somewhat rocky start emotionally. A significant other may be saying something that frustrates or bothers you, or you could be blowing a situation out of proportion this morning, largely due to a Moon-Mercury conflict that skews our perceptions to the point that we are seeing things through our insecurities. However, as the day advances, your confidence builds, and this may be in direct proportion to your ability to take action. You are virtually fearless when it comes to facing problems, and others are drawn to you. You can feel a strong sense that you can combine warmth and intimacy with playfulness and freedom today, Sagittarius. Although this morning can involve a possible misunderstanding or a situation (likely work or health related) that is blown out of proportion, as the day moves forward, confidence builds. Speculation is replaced with a desire to take positive action. Later today is very strong for reducing mental stress by physically doing something, whether this involves taking on an organizing project, or taking a brisk walk if possible. In the first half of the day, there can be some sensitivity to what a partner, love interest, or child has to say, Capricorn, or you could become very easily worked up over matters as you imagine what might go wrong. It’s a morning of possibly misunderstandings and perhaps perceptions skewed by fear and emotion. As the day advances, however, there is very strong energy for taking charge. You are courageous when it comes to finding the source of a problem and dealing with it. You don’t want to be weighed down or restricted by fears. Physical activities or games can really help reduce stress. In the first half of the day, you could become worked up over a domestic or family matter, Aquarius. Alternatively, you could be taking things very personally and having a very hard time winding down and relaxing. As the day advances, you feel more capable of taking charge and handling problem areas confidently. This is also a very strong day for taking care of others and coming across exceptionally well, particularly at work or school. You feel valued now. In the first half of the day, there can be sensitivity to sharp words, Pisces. Watch for getting yourself worked up over small problems or tight schedules. Later today, ideas shared in group settings or with friends and through networking activities can help you heal. It’s a strong time for helping others through words or teaching. You could find yourself in a position of mentor. You could discover that you share similar basic values with someone special in your life. Offering someone freedom is seen as especially nurturing and mature. If Your Birthday is April 27th, If Today is Your Birthday full horoscope here. Cnj 07°Ta59 SCHEDIR The Queen, female power, mysticism. Cnj 24°Ta24 CAPULUS— Sexual and/or aggressive; shame, obsession. Moon 13° Scorpio 26' 58"
Mercury 04° Aries 06' 24"